The Light Sensor can be used for measurements of light intensity in a variety of situations. Perform inverse square light intensity experiments using a point source of light. 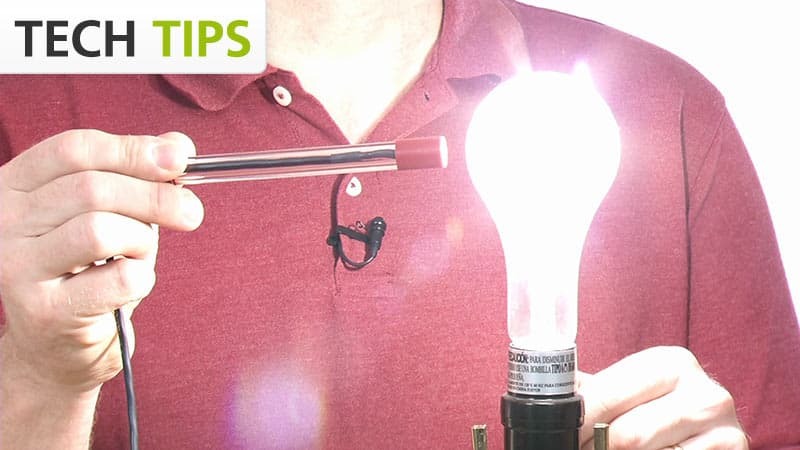 Demonstrate the flicker of fluorescent lamps and other lamps. Carry out solar energy studies. Study light intensity in various parts of a house or school. Use it as part of a study of plant growth to measure light intensity. The switch on the box is used to select the range. If the reading from the sensor reaches the maximum for the selected ranges, you need to switch to a less sensitive range. If the reading is very small or 0, you need to select a more sensitive range. The 0–600 lux range is the most sensitive range. It is useful for low levels of illumination. The 0–6000 lux range is a good general purpose range for indoor light levels. The 0–150,000 lux range is used mainly for measurements in sunlight. The sensor uses a silicon photodiode. It produces a voltage that is proportional to light intensity. The spectral response approximates the response of the human eye, as shown in this diagram. First, eliminate all artificial light sources (except battery-powered flashlights) and try your experiment again. Next, test the Light Sensor positioned as you plan to use it. Set the sampling at 1000 points/second for 0.1 second. If the flicker is the problem, you will see a drastic variation in the light intensity with a period of 60 or 120 Hz (50 or 100 Hz outside of North America). If the overhead flicker is an issue, set the sampling rate to a number that is not a factor of 60. For example, using 30, 20, or 10 samples/s is worse than using 17, 23, 27 samples/s. If you have watched the related product video(s), followed the troubleshooting steps, and are still having trouble with your Light Sensor, contact Vernier Technical Support at support@vernier.com or call 888-837-6437. Support specialists will work with you to determine if the unit needs to be sent in for repair. At that time, a Return Merchandise Authorization (RMA) number will be issued and instructions will be communicated on how to return the unit for repair.